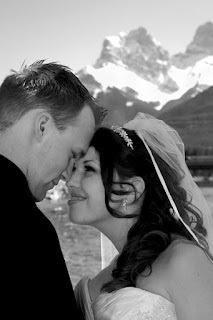 Happy anniversary to my darling husband of 4 years! A lot has happened in such little time, and it's almost hard for me to believe that it has only been 4 years. As a quick overview of my own brand of love story, Matt and I went to high school together where in our graduating year I made as many excuses as possible to bump into him. We started dating the September after we graduated and I had moved to a different city, but over the next 9 months we still managed to see eachother nearly every weekend, and to talk every night. I knew I loved him after our first month together. He knew he loved me before our first official date :) I moved back home to go to college and we spent more and more time together, hanging out with friends and family and talking about the future. After two years of dating, Matt proposed and 6 months later we got married in the mountains. I can't tell you all how lucky I've been to have Matt. Seriously, I'm luckier than I deserve. And I don't just mean it because I think Matt is a great guy and because I love him so much - I always knew he was a great guy. But I mean it because of what a great man Matt is becoming, which is something I didn't consider seriously enough when we were dating. Matt and I have had some hardships through our marriage including a number of painful losses that were very difficult times for us. Our hardships actually started after 3 months of marriage when I found out I was pregnant, and anemic, and I could barely make it out of bed each morning to get to work late, let alone make dinner or clean the house. I gave all I had to my job, which still wasn't enough, and at the end of the day I had nothing left to give to Matt. But he still loved me through it. Matt started changing a bit before we had our first son - and only in the best ways. He sold his motorbikes, which he told me he'd never get rid of, to help pay off debt so that we could afford a house. He started reading his bible more and studying scriptures a lot, even listening to sermons while he was at work. He started to challenge me more on my knowledge and understanding of the bible, and demonstrated to me what being the 'spiritual leader' of our house really meant. You see, I believe that men should lead. Call me old-fashioned, call me chauvenistic, call me whatever you choose - I call it 'biblical'. I believe that men are to be the leaders of their household, are to shepherd their families, acting as pastors within their own households with their primary ministries being to their wife and their children. I believe that men should be providers, that they should be responsible for the affairs of the household and that they should be continually wrestling with the scriptures and working through their own salvation with fear and trembling and then taking their wisdom to their family and sharing it with them. This is the example Matt has set in our household. Matt is the head of our family. Does that mean he's the king? Does that mean that what he says goes? Does that mean that I can't do anything unless he says so? Of course not. But it does mean that Matt is responsible to lead and to set a good example and to make wise decisions, that he acts upon those responsibilities and that he takes ownership of blame when any is to be laid in our household. My husband is a humble man. He is a gentle man. He is a compassionate and loving man who has never said a word to intentionally hurt me. He speaks to me in gentle tones and never with bitterness or sarcasm, even when he is upset with me, he craves my input and seeks out what wisdom I may hold, he entrusts the household to me. He doesn't oppress me or harm me in any way shape or form - and yet he is still the head of our household. That is why I feel so lucky, and so incredibly blessed today, looking back at the past 4 years. When we were dating, I didn't think about the proper qualifications for a husband. I knew I loved him, I knew he was a Christian, and I thought that was enough. But 4 years of marriage has taught me that it wouldn't have been enough. I'm crazy about my husband, but we've gone through seasons where I had to remind myself daily that I really did love him. I didn't consider whether Matt would be an active, attentive and involved father when our kids came along - I just assumed it would happen. Most importantly, I hadn't thought about having a husband that would be a spiritual leader, not just a professing Christian. I'm the type that would always submit to my husband, that's how I'm wired. I want to be lead, and I want to have someone big and strong to care for me. So if Matt stopped reading his bible and started coasting through his spiritual life, I'm sure that I would have continued with my own devotions, but would I have grown as much as I have in the last 4 years? More than unlikely. I doubt that before we got married Matt seriously thought about how to lead a household. He thought about ways that he could be loving to me and maintaining date nights and even doing devotions - but that is such a small fraction of what it actually means to be the loving head of a household. But did he think about how when our 2 year old would have a nightmare in the middle of the night and how he'd have to go in and comfort the child by teaching him that God is sovereign and that we have nothing to fear because it's all in God's hands? Or did he think about how he would have to deal with his wife when he was angry at her after an arguement and how he'd lovingly and humbly come and apologize for any pain he had caused her, even while he was still hurting? Or did he think about all of the hobbies, and all of the fun, and all of the free-time that he'd have to give up to be with the family he loves, all of the job opportunities and opportunities for self-improvement that he would pass up to do what's best for his family? I can vouch that no, he didn't :) But I am so grateful that, by God's grace, somewhere between then and now, Matt thought about it, and he decided to step up and be a man - to be my man. I love you Matthew - my leader, my provider, my lover, my friend, my partner-in-crime, my rational thought, the calmer of my anxieties, the father of my children and the husband I always dreamed of having.